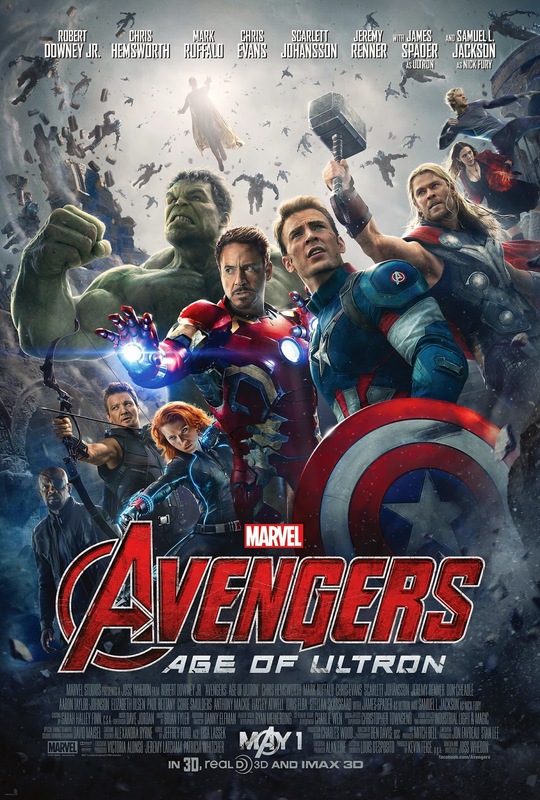 Well, it is time for the Summer of Marvel and today we start with Marvel's most recent release, Avengers 2: Age of Ultron. Now, I am still a bit too stuck in the post-theater viewing HOLY-COW-THAT-WAS-AWESOME-MOOD to give it a truly discerning and honest evaluation, but I will give it my best go. But, in short: It is well-worth the $10 to see it. SPOILERS! : Though I will avoid giving some big spoilers for the movie, there are some pretty big spoilers for Captain America: Winter Soldier, but if you read Andrew's review then you should be mostly fine, however there are some things he left out. The movie opens with all the Avengers attacking one of the last HYDRA outposts in Sokovia to retrieve Loki's scepter (don't ask). They succeed but run into two twins, Pietro and Wanda Maximoff, Quicksilver and Scarlet Witch in the comics, who have the powers of super-speed and telekinesis/telepathy/give people weird visions/dreams, respectively. They don't do much here aside from Pietro knocking Hawkeye off his feet and Wanda giving Tony a vision of the rest of the Avengers dead, which causes him to make some rather stupid decisions throughout the rest of the movie. The Avengers grab the scepter and bring it back and the Avengers decide to hold a party to celebrate a successful victory. In the meanwhile, Stark and Banner decide to use some of the tech they picked up at the HYDRA base to develop an AI called Ultron, which will be used to create a shield to protect the earth from another alien invasion. Oh, and they do this without telling the rest of the team. So, the party goes well with the audience learning about the various. Thor and Stark, explain why Portman and Paltrow are not in the movie, discuss their girlfriends' achievements, Thor and Steve Rogers drink some Asgardian alcohol "not fit for mortal men" with Omaha Beach veterans, and we learn that Black Widow, or Natasha, and Bruce Banner are in a weird relationship. Natasha has developed a rapport with Banner and, as is depicted in the opening fight scene, is responsible for bringing Bruce out of Hulk mode, and are romantically attached to each other but Bruce, due to his habit of turning into a "giant green rage monster", is quite hesitant. More on this in the "My Thoughts". The revelries die down and people disperse as the gang plays a (hilarious) contest of "Who can pull Thor's hammer" until things are rudely interrupted by an Ultron who has awoken, become sentient, whacked Tony's computer butler JARVIS, and now wants to do something evil that involves destroying the Avengers. He fights them, they destroy his current robot body but he has plenty of other ones and leaves the Avengers Tower and joins up with the Maximoff twins who hate Stark. So the Avengers must hunt him down and stop him from remaking the world "better". Again, I still can't give a completely discerning view of this but let me give it a shot. I don't think it is quite as good as the original but that is more because the original was ground-breaking in the way it brought together a group of characters from different movie series and threw them together. But it still works, albeit with a few glitches. The humor here does not work quite as well as it did in the first one. That's not to say there aren't moments when it doesn't work, it works 90% of the time but it falls flat a few times. The biggest example being when Tony and Thor are discussing their respective girlfriends, comparing their successes in their respective fields in a game of "My girlfriend is cooler than your girlfriend." Yeah, its boring. But for the most part, the humor still works. Some characters, especially Clint and Natasha are given a tad more development and backstory. Clint has a family and a farm and we learn a bit more about what Natasha went through when she was being made into the Black Widow, both from her dreams and her dialogue with Banner. But enough with the negatives. The movie is a lot of fun. The fight scenes are cool. Ultron is a great villain, played brilliantly by James Spader, and actually providing some of the best jokes in the movie. His only flaw was that I could never really figure out his goal was or why he wanted to do it. Something about "changing humanity" involving destroying it. But he is not alone in the MCU in having a poorly-explains end-game and he is far from the worst in that regard. There is another new character, Vision who, well, I can't say a whole lot about him because he didn't get a whole lot of screen time. But, what I did see showed a great deal of potential. A character who is deeply compassionate, probably more so than the rest of the Avengers, yet willing to do what is necessary to preserve life. Now, the true highlight of the movie is the twins, Pietro and Wanda, performed by Aaron-Taylor Johnson and Elizabeth Olsen. They have a ying-yang quality, with Pietro being the funny, wise-cracking jokester and Wanda the darker, more serious one. Their chemistry is very good and they are quite likable. Also, their switch to the Avengers (let's face it, you knew that was coming) is played well enough that it feels rather naturally. Interestingly, these two characters allow me to pass a much harsher verdict on the director, producers, and writers of Godzilla and the movie, itself. Why? Because in that movie you had two main characters, a husband and wife, played by the same two actors, who were unbelievably wooden and boring. Now, having seen those two actors play fun and at least moderately engaging characters, at least if given the right script and direction I can safely say it was not the fault of the actors but the director, producers, and writers of Godzilla. So, there it is. A fun movie that, while not as quite as good as the first, still brings what a good popcorn movie needs: Fun. Next Week: Iron Man (2008). Note: When this comes out on home video I might do a follow-up where I give a better look at it. Then with the benefit of the passing of time to allow me to think more on it. I agree, not as good as the first Avengers film, but still a lot of fun. I don't think Joss Whedon was able to work the exact same magic simply because he had a different set of ingredients to work with. The first film was about uniting the different characters' stories into one narrative. This film was really about shuffling the deck that was assembled the last time and trading a few cards. Also, Whedon famously dislikes 2-part movies. He likes his films self-contained, so he stuffed this one tight to preserve that. The film shows some stretching at the seams, but I'll take that over needless filler. Narratively, I think this film demonstrates a shift in how future Marvel films will unfold. There was a significant amount of establishing characters' backstory without an expicit origin story. This was done to largest effect with Black Widow, but also to a lesser extent with Hawkeye, The Twins, the Brutasha romance (yeah, I just did that). The Vision also received his origin story in the context of a narrative with an entirely different focus. Granted, he's kind of a unique case. Based on reviews so far, I think this went over well. It will certainly serve the franchise well as it looks to incorporate Spider-Man without bludgeoning moviegoers with yet another Spidey origin. Same goes for adding further characters without an endless onslaught of origins. Responding specifically to the "my girlfriend is better" tête-à-tête, it didn't fall flat for me because I saw that as an extremely self-aware bit meant to poke through the fourth wall. This is in keeping with the tone near the end of the pre-Ultron episode of Agents of S.H.I.E.L.D. where Coulson offhandedly mentions that Nick Fury is still alive, then turns to the camera--ostensibly facing an off screen character--and says "Woops, spoiler alert." I watched this one in the theater twice, once with my wife, once with the kids and I got a lot more out of it the second time. A bit overwhelming the first go and I was able to relax and focus a bit more the second time. The running gag with Thor's hammer and the big pay-off at the end made the audience gasp as my viewing. And the speech Hawkeye gives Wanda at the end...just great stuff. I haven't seen this one, actually, so I can't comment. I will say that I wasn't really impressed with their first movie. I have, however, enjoyed the cartoons. And in that, I did like the Ultron story quite a lot. Which cartoons? The new ones? The Avenger stuff on Netflixs. I think they have 2 series of them? And they have multiple seasons of both. "I agree, not as good as the first Avengers film, but still a lot of fun." More or less my feelings. "The first film was about uniting the different characters' stories into one narrative. This film was really about shuffling the deck that was assembled the last time and trading a few cards." I kind of want to know how they incorporate Spider-man considering we've been hit with his origin story twice in the past 15 years. I don't mind the Marvel universe sometimes leaning on the fourth wall, as they typically do it quite well, but this felt like shoe-horned in reason for the characters to not be present in the movie. At least, to me. "And the speech Hawkeye gives Wanda at the end...just great stuff. " That was a highlight to me. I am thinking of possibly looking at and reviewing Avengers: Earth's Mightiest Heroes. I've seen the first few episodes and what I saw, I liked. Right now I am just focusing on the live-action Marvel movie series. But we'll see how the summer goes. Kit, I've really enjoyed those. I think they are called Avengers: Earth's Mightiest Heroes and Avengers Assemble. Each has two seasons and for the most part, they have been very good. They are not depressing like the recent DC animated films, they aren't awash in left-wing politics like the DC stuff, and they are really well done. Ok. Well, I will give it a look. I have been watching Avengers: EMH on Netflix off and on. A side-note: Netflix's new Daredevil series is AWESOME! Oh, and the Summer of Marvel Mondays will return with Iron Man! As to the Subtitle - The cross-over synergy between Marvel/Disney/Star Wars has so far been a net benefit, not cringe inducing. "No Strings On Me" was brilliant use of a Disney property that added to the drama. It even goes so far as Patton Oswalt's Star Wars bed sheets in a recent "Agents of Shield" episode. Those have been nice touches. Thanks for the review, Kit. I liked the film too. Very entertaining. The Netflix Avengers cartoons are good. IMO, Hulk and his Agents of S.M.A.S.H. is better, and a lot funnier. I have to admit, I was a bit let down with Ultron. He wasn't all that menacing or much of a threat. The movie is entertaining enough, but I wouldn't put in the top 3 of the Marvel Cinematic Universe.